Sometimes, staying in on a Saturday night is the absolute best option for dinner. This is exactly what we did yesterday. The evening started out with a visit to Life grocery store in Hatagaya – nothing fancy – kind of like an Albertson’s. 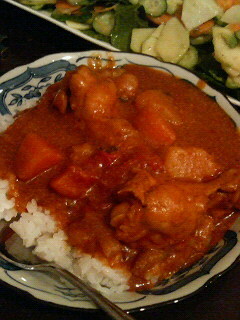 My boyfriend Washi who is Japanese, made… surprise: Japanese curry. Me being Californian, made… surprise: salad. So the nutritionally balanced menu was set for the night. My salad was quite standard consisting of spinach, carrots, Japanese cucumbers, avocados and apples (latter two representing Northern Californian-fare) with balsamic vinegar dressing. Washi supplied a disclaimer that he had not made curry in five years. I was simultaneously scared and charmed. Scared of how a five-year hiatus will affect the end product, and charmed that I would be the first person in five years to try this said curry. Turns out there was no need at all to be scared – in fact, the curry was absolutely delightful – why? The twist: he used milk instead of water and added one can of whole, peeled tomatoes. 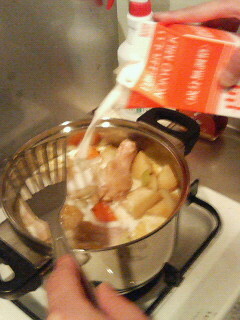 Other ingredients included two cloves of garlic, one onion, two small potatoes, one carrot six small chicken drumsticks and Japanese curry cube stock. You are currently browsing the archives for the Curry category.